Expanding an incubator from 6 companies to more than 80 with just 45 days to recruit. Advanced manufacturing in NYC is growing. How many more startups could we help? SecondMuse incubated startups from across the city and ranging from VC-backed to moonlighters. $2.4m invested back into the local economy, 71 new jobs. Pound-for-pound, manufacturing is the best economic-development engine on earth. Hyperbole? Maybe. But if you’ve seen the stats on corporate-relocation tax breaks, new baseball stadiums or luring the film business to your state, manufacturing medals gold. For every $1 invested in manufacturing, $1.89 comes out. Alongside, New York City Economic Development Corporation, SecondMuse has been investing time and thought into rebuilding manufacturing here in New York City. 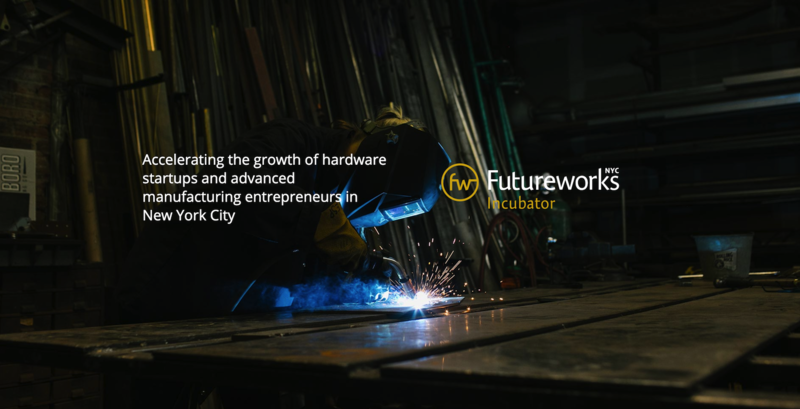 The Futureworks Incubator accelerates the growth of hardware startups and advanced manufacturing entrepreneurs in New York City. In its 2017 program year, the Incubator supported 84 startups from May to December 2017, with 71 companies completing participation requirements. The Futureworks Incubator is built for all corners of the NYC hardware ecosystem. This open community includes early to growth stage startups, mentors, prototyping hubs, big companies, service providers, and others who are igniting the advanced manufacturing sector in NYC. The SecondMuse team used a variety of recruitment tactics to source 130 applications to the Futureworks Incubator. The foundation of the campaign was broad public outreach on social media and blogs. The team attended more than a dozen outreach events that included networking at relevant meetups around NYC, hosting lunch and learns at partner spaces, and participating in speaking engagements. The outreach campaign also included direct emails and meetings with potential applicants in SecondMuse’s network. Based on their stage of development in accordance with the selection criteria, the accepted startups were placed into one of three Tracks: Idea to Prototype, Market Validation, or Scale and Manufacture. Teams were divided into cohorts to receive targeted support and to promote shared learning with others who were at a similar stage. The program curriculum (elaborated upon further in the “Experience” section of this report) also included opportunities for collaboration between the broader group of teams. In order to meet the participation requirements of the program, companies were required to participate in at least two Workshops and their Track Summit. “[The team] knew exactly which startups were in alignment and could benefit from the same resources. I felt they were very serious about us reaching our goals and providing an amazing product-startup-plan template to stick to as well as hands on workshops.” . Mentors act as subject-matter experts, advisors, and lifelines to Futureworks Incubator companies. Mentors are representative of the broader ecosystem, coming to the program from backgrounds in entrepreneurship, marketing and storytelling, engineering, product design, venture capital, manufacturing, and more to support the growth of Futureworks Incubator startups, and the advancement of the local hardware ecosystem. Like the companies, Mentors were required to submit an application where they were vetted based on their relevant expertise and years of experience. Mentors also participated in an in-person orientation where they contributed to designing mentor engagement with the program in a co-design session led by the SecondMuse team. The SecondMuse team recruited Mentors through its network and attending meetups and events. Prospective Mentors were invited to an organized happy hour where they had a chance to meet with others who were interested in being program mentors and learn more about Futureworks from the program team. The success of this event led to attendees opening their networks and making introductions to other mentors. Mentors could opt to participate in a variety of ways, including serving as dedicated mentors to one late-stage team, mentoring at Showcases and Workshops, offering in-person or Virtual Office Hours, or simply being available to field asks for help through Slack or email. In order to formally be considered part of the program, Mentors were asked to participate in at least one Futureworks Incubator event. Event participation entailed offering pro-bono expertise and advice at Summits, Workshops, and other events. The Futureworks Incubator curriculum was tailored to companies based on their stage of development when they entered the program. The program grouped companies into three distinct cohorts: Idea to Prototype (Track 1 – earliest stage), Market Validation (Track 2 – intermediate stage), and Manufacture & Scale (Track 3 – latest stage). For each of the three tracks, the program was built around developing key relationships with mentors, other startups, prototyping spaces, and other service providers with the relevant skills and experience to propel their businesses forward. Upon their acceptance into the program, teams were required to submit a Product Startup Plan (PSP), a tool created by SecondMuse for teams to identify their needs and prioritize what they sought to accomplish during their time in the Incubator.